In our last article we witnessed first-hand the electric ‘resurrection’ of George Forster in 1803. This gruesome act was performed by a charismatic, exuberant scientist named Giovanni Aldini, hell-bent on challenging the perception of life and death as we knew it. In short, as you might imagine, this is someone I could share a drink with (I’m told that during the demonstration, a feeble-willed doctor fainted, which underscores my belief that practitioners of science rarely have the stomach for the kind of work that will propel it to the heights it could truly achieve). It’s some form of dance, but where you are definitely the dominant partner. Who was Giovanni Aldini, and how did he come to be at the Royal College of Surgeons, not less brought by prestigious invitation, to perform such experiments before the most esteemed medical minds of the English empire? Aldini was shunted into a medical career from an early age by his mother (we are eternally grateful, madame), who was no doubt eager to see him absorb a little of the renown and notoriety of his uncle, Luigi Galvani, most noted for work in his studies of the electrical anima in all living things. Whilst studying at Bologna University, he assisted his uncle in his experiments and edited the notes of the reclusive professor’s masterwork in 1791. Galvani’s contemporary, Allesandro Volta disputed the theory of innate biological electricity, and in the most obstinately productive method of disagreeing with someone went ahead and invented the first ever battery to prove his point. 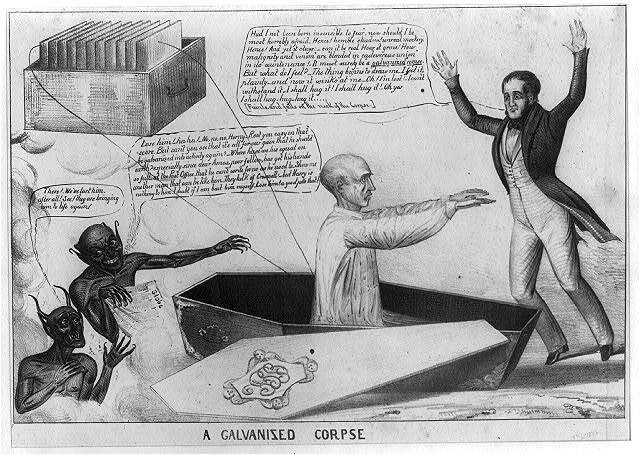 That said, Volta’s most vocal opponent was not in fact Galvani, but his perky young nephew Aldini, who performed the experiments in the most astounding and dramatic examples of macabre medical science. As I mentioned, a man after my own heart. One assumes that Aldini, although inspired, was not impressed by his uncles use of something as insubstantial as some silly little frog legs, and decided to apply the galvanic principles to all manner of larger, more flammable species, from lambs, calves, bulls, monkeys and sheep. There were no pesky animal interest groups in those days, that’s for sure. If you could breed it, eat it or keep it as a pet, it was also prime electrocution material for the Bolognesian doctor. “Aldini, after having cut off the head of a dog, makes the current of a strong battery go through it: the mere contact triggers really terrible convulsions. The jaws open, the teeth chatter, the eyes roll in their sockets; and if reason did not stop the fired imagination, one would almost believe that the animal is suffering and alive again”. It wasn’t long until he commenced human testing, taking the first steps towards using electricity as a therapeutic procedure. Undeterred by the potential dangers or even perhaps by common sense, he experimented first on himself. The effect, while only using a mild shock, resulted in a hefty headache and several days of chronic insomnia. There is only one recorded example of Aldini performing the procedure on himself yet you can be sure it that it wasn’t an isolated incident. The man liked pain, it would seem. Content with the results, Aldini performed the procedure on another subject (one who was actually sick, not just for the fun of it). History tells us it was Luigi Lanzarini who was the lucky victi-, er, patient, a farmer who had been admitted to a sanitarium for the ambiguously termed condition ‘melancholy madness’. Using a weak current applied to the skull, Aldini’s ‘electro-convulsive’ treatment was a total success (by the standards of the time), rendering the man cured and able to conduct a respectable existence, albeit with severe memory loss. Then again, he had been in a mental asylum in the 18th century, so perhaps it was memory worth losing. This is why they didn’t let Aldini cut up the Christmas turkey – no-one likes food that might blink at you. In a time period and a culture that never let morals and ethics get in the way of a dramatically violent experiment (oh glorious times), Aldini was revered and became extremely wealthy. Additionally Napoleon Bonaparte himself, perhaps feeling a bit guilty for his uncle’s public discrediting, awarded Aldini the Knight of the Iron Crown, and made him a councilor of Milan into the bargain.